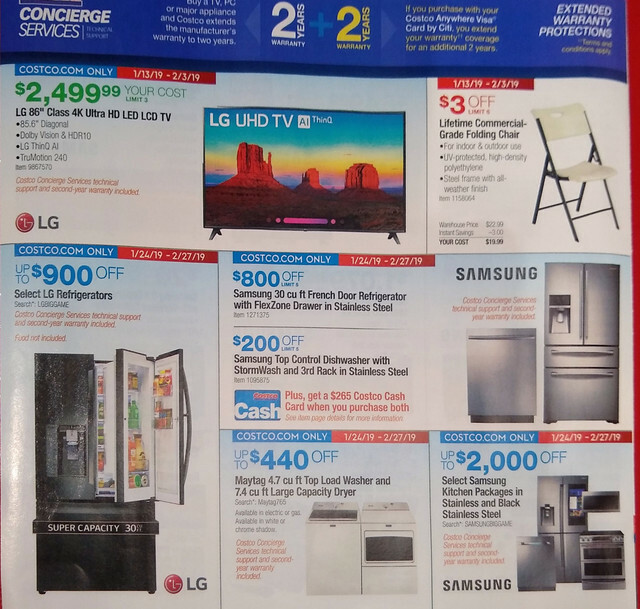 Discussion in 'Coupons, Discounts & Sales' started by Chris DeVoe, Jan 23, 2019. 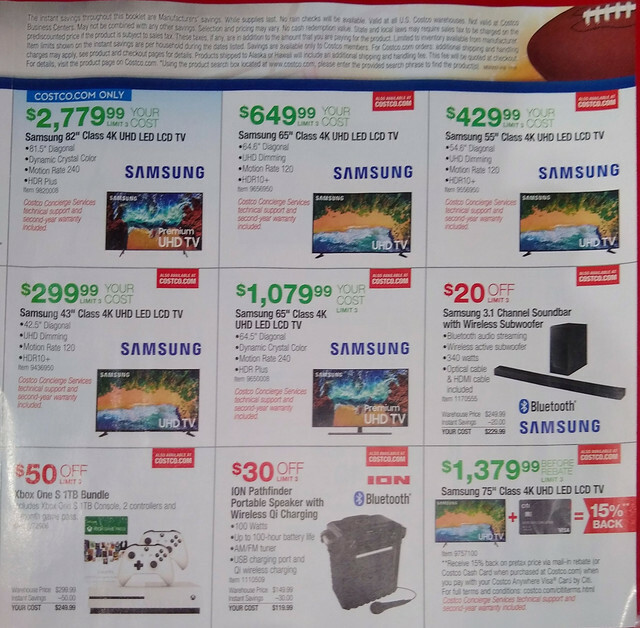 I was in my local Costco, and they had a flyer with some what looks to be really great prices on TVs and a few other things. PhantomStranger, MarkO, lightbulb and 2 others like this. I wonder if those are on sale! I'm actually in the market for a new tv but am having difficulty pulling the trigger. I'm looking for a 75 inch but the prices and reviews are all over the place. The Sammy in the the flyer looks good but I need to be under $2,000...and as far under that I can get without sacrificing picture quality. I need to do something soon, pretty sure the prices won't be low again till black Friday. 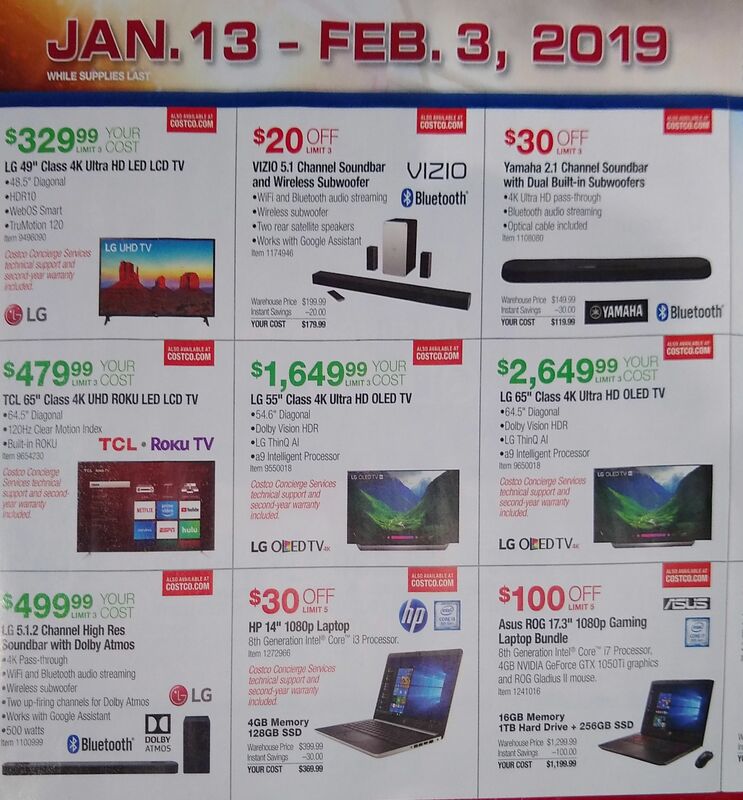 This flyer was at the CostCo on Linwood in Kansas City, so you can go look at it and find if the extra $300 is worth it. Thanks Chris. The problem I'm having with shopping is that the tvs are displayed with a fancy-schmancy graphics loop which makes it difficult to determine the quality of one vs. the other, they all look spectacular. It'd be nice to see some real world content for comparison. I am thinking of buying from Costco though, they seem to generally have the best prices, extended warranty, and a generous return policy. I used to work at BrandsMart, a serious audio video place that had excellent display rooms, living room like lighting and a wide range of source material to demonstrate - and was driven out of business by Best Buy. The problem is all the things necessary to make an informed decision are incompatible with the lowest possible price. If I were shopping for a TV myself, I go out to Nebraska Furniture Mart - a bunch of my former BrandsMart mates wound up out there, and I'm pretty sure they'd let me play whatever material I want it on any of the televisions I wanted. Twinsfan007 and forthlin like this. That's a good tip, Thanks! I remember Brandsmart from my time in Miami, bought a Pioneer CTF-1250 cassette deck there. This was the Kansas City BrandsMart. Unrelated to the East Coast one. The BrandsMart you’re talking about is still in business here in Miami. The one I worked for was only around the Kansas City area. We only had seven stores at the most. When I was at CES, a lot of people were confused about that. forthlin and black sheriff like this. 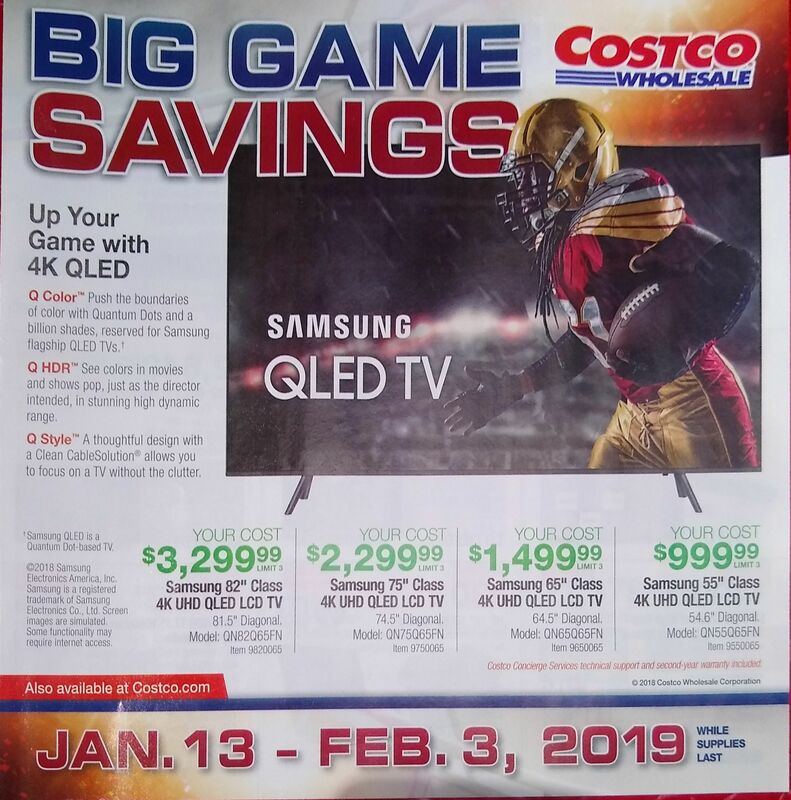 When you walk into the Costco here the TVs greet you. They look really cool, but my TVs aren’t dead yet so it’s hard to justify the upgrade. I know! I've got a 15 year old 1080i Samsung, and it's working perfectly fine. I want the extended color depth contrast ratio but I could give a fig about the extra resolution. ...I need to do something soon, pretty sure the prices won't be low again till black Friday. ...I am thinking of buying from Costco though, they seem to generally have the best prices, extended warranty, and a generous return policy. The last time I needed, and the next time I will need to buy a TV, it’s Costco. You can “test” the model you’re eyeing, at home. Spend a few days with it. If something isn’t right, just bring it back into the store. *well, they may ask if it’s defective/damaged. Anyway, we picked up a new TV, at Costco later that day. Getting it home, setting it up, we realized there was ONE dead pixel on the screen. 5 days later, it never “revived”. Just a pink/red dot drawing your eye to that part of the screen. So, packed it up, hauled it into the Costco. Then I realized it was the day after The SuperBowl, and a World Championship Heavyweight Boxing match. Absolutely no reaction from the salesman. He issued me a full refund.